us a simpler way of calculating a specific subset of line integral problems—namely, problems in which the curve is closed (plus a few extra criteria described below). We won't concern ourselves with using this formula to solve problems in this article; we'll save that for future lessons. In this lesson, we will require that the curve \(c\) be closed plus specify some other restrictions (but even with these conditions, our analysis will be pretty general); after doing so, we'll take the line integral, then do some calculus and algebra to derive a simple formula for calculating that line integral. Although this derivation might seem pretty tedious at times, just remember that it's mostly just calculus and algebra which you are already familiar with. We derive Green's Theorem for any continuous, smooth, closed, simple, piece-wise curve such that this curve is split into two separate curves; even though we won't prove it in this article, it turns out that our analysis is more general and can apply to that same curve even if it's split into an \(n\) number of curves. In this lesson, we're going to focus on proving Green's Theorem. We discussed in a previous lesson how to calculate any line integral by parameterizing the integrand and limits of integration. Solving that parameterized integral can be quite tedious sometimes but it is, in general, how we calculate any line integral. But what if we considered calculating a special subset of line integrals that involved taking the line integral of a vector field around certain types of closed curves? Well, when it comes to calculating these kinds of line integrals we don't have to use that complicated parameterized definite integrals discussed earlier. 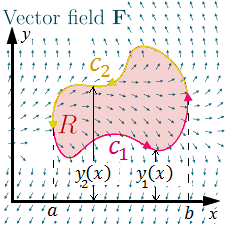 For such line integrals of vector fields around these certain kinds of closed curves, we can use Green's theorem to calculate them. Figure 1: The curve \(C=C_1+C_2+C_3+C_4\) is piece-wise smooth. It is "piece-wise" because it is split up into an \(n=4\) number of separate curves with an \(n=4\) number of "edges." It is "smooth" because each individual curve itself is smooth without any sharp edges or cusps. This curve is also positively-oriented because its direction goes counter-clockwise. Image by Cronholm 144. These particular kinds of closed curves can be fully described by the following description: they are any arbitrary curve \(C\) on the \(xy\)-plane that is piece-wise smooth, positively oriented, simple, and closed as illustrated in Figure 1. That description might sound like a mouthful, but let's break down the meaning of each term. A closed curve, as the name suggests, is any curve such that if you start at a point on that curve and then "walk around" that curve, you'll come back to the same point that you started at. A simple curve is any curve that doesn't criss cross and intersect itself; for example, a curve shaped like the number eight would not be a simple curve. A positively-oriented curve is one that you travel around counter-clock wise and a piece-wise-smooth curve can be subdivided into an \(n\) number of smooth curves with an \(n\) number of edges. 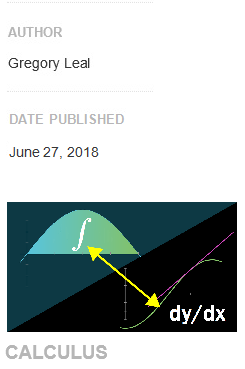 Whenever we take a line integral of a vector field around these kinds of curves, it is usually easier to calculate the line integral using Green's theorem. Figure 2: We can split the curve \(c\) into two separate curves, \(c_1\) and \(c_2\). This also allows us to split the function \(y(x)\) into the two separate functions, \(y_1(x)\) and \(y_2(x)\). Figure 3: We can break up the curve \(c\) into the two separate curves, \(c_1\) and \(c_2\). This also allows us to break up the function \(x(y)\) into the two separate functions, \(x_1(y)\) and \(x_2(y)\). In the next couple of lessons, we'll use Green's theorem to solve some line integrals of vector fields over piecewise smooth, simple, closed curves.